Rapid Diagnostic Tests (RDT’s) are single-use diagnostic tools for use with few or no additional resources. Combined with lenient storage and limited training requirements, they are suitable for use in low resource environments, and have quickly become the mainstay of field-based diagnosis across many applications. In the case of malaria, they have largely replaced the more labour intensive giemsa stain microscopy method, which requires both relatively expensive equipment and skilled operators. So much so that in 2014, more than 70% of all diagnostic testing for suspected malaria was carried out with RDT’s. As with many similar rapid tests, malaria RDT’s are based on parasite antigen recognition by labelled antibodies. When infected blood is added to the test cassette along with reaction buffer, the presence of the malarial protein PfHRP2 (histidine-rich protein 2 of Plasmodium falciparum) causes dye-labelled anti-PfHRP2 antibody to aggregate on a visible test line. 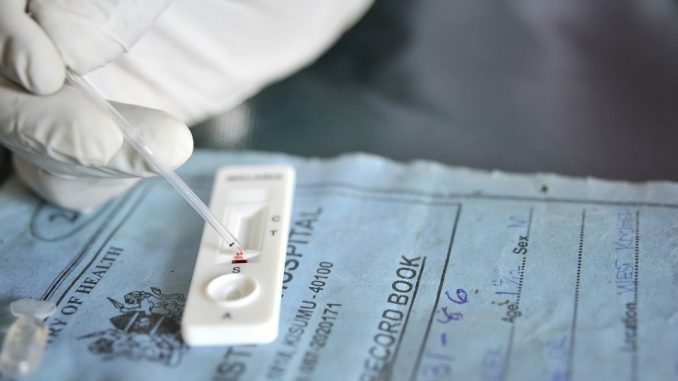 In recent years, infections with P.falciparum with pfhrp2 deletions causing false-negative RDT results have been reported in the literature, causing concern for the implications on malaria control and eradication. In a current paper in the Journal of Infectious Diseases, Dr. Jonathan Parr and colleages examine this problem on a country-wide level in the Democratic Republic of the Congo (DRC). The authors collected samples from children under 5 years old as part of the annual Demographic Health Survey. Three standard diagnostic tests were performed on all tests: Microscopy, Polymerase Chain Reaction (PCR) and RDT’s. Presence of pfhrp2 gene deletions was also determined by PCR. They found that the proportion of all infections with the pfhrp2 deletion was approx. 6%, and importantly that it was 19% in confirmed infections with a negative RDT. In other words, around one in five false negative RDT’s were associated with the gene deletion. Interestingly, the authors found significant clustering of deletion mutants in the provinces Kinshasa and Kivu. Because RDT’s were introduced first in these areas of DRC, it suggests selective pressure is behind the occurrence of deletion mutants in these areas – in other words, that “escape mutants” with a gene deletion causing RDT tests to produce false positive results are an evolutionary response by the malaria parasite to evade detection. This interesting hypothesis has yet to be tested further, but represents an important potential challenge in the longer term for malaria control and eradication. If deletion mutants are the result of selective pressure, the process has gained significant traction in the space of a decade. Without mitigating efforts, their prevalence is likely to rise and pose a growing challenge to public health. Although there are alternative RDT’s recognising different antigens, according to the authors these are not widely used in sub-Saharan Africa due to concerns around heat stability, lower sensitivity for P.falciparum infection, higher cost and limited availability. The study provides an interesting glimpse of the future in the long running struggle against malaria in sub-Saharan Africa. With the risk of widely used and inexpensive diagnostic tools losing their utility in the field, this opens the possibility for years of hard earned gains to be reversed. At present, this appears to be a development to watch, and for device manufacturers to take note of. For more information, see Parr J. et al, “Pfhrp2-deleted Plasmodium falciparum parasites in the Democratic Republic of Congo: A national cross-sectional survey“, Journal of Infectious Diseases (2016) and University of North Carolina press release. I must congratulate the team undertaken the task. Further, refer to last two paragraphs; it is mentioned: “Although there are alternative RDT’s recognising different antigens, according to the authors these are not widely used in sub-Saharan Africa due to concerns around heat stability, lower sensitivity for P.falciparum infection, higher cost and limited availability”. Sir, it won’t only be a boon for sub-Sahara ,but also for all those countries where malaria (P.facifarum) is (endemic)and an alarming problemand also where ever the paddy is grown in the tradional style. Best of Luck. Very interesting. Not surprising though. Probably would find same phenomenon here in Ghana. This is something worthy putting on watch for the tropical diseases research center in Ndola, Zambia. Zambia just like other countries is endemic to pfhrp2. the sooner more research is done to develop alternative reagents which wont have the limitations observed in the article the better. Otherwise we are in big problems.